Read your energy bills! You will be able to identify patterns in your energy consumption and will quickly be able to identify if there is suddenly a peak in your electricity bill. If this happens, identify which of your appliances are drawing the most energy and monitor the use thereof. If you already have underfloor heating, check the programmed schedule on your thermostat and ensure the heating is only activated when you need it, at the most optimal temperature. Curious about the Running Cost of a System? It is worth investing in a thermostat that also allows you to monitor your energy usage. Some ‘smart thermostats’ can control the heating on behalf of the householder, constantly keeping the home at the right temperature, effortlessly. 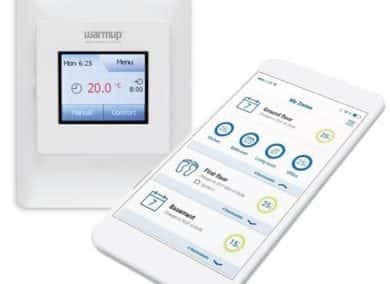 These thermostats allow the user to control electric underfloor heating systems on any scale via an app, giving them easy access to full control. The mobile app makes it easy for users to organise their thermostats to exactly match their temperature control needs. What is more, detailed information on energy consumption etc. allows users to control the heating to maximise their energy savings. Within a few months, you will be able to see how it affects your cost savings. Warmup’s latest Smart Thermostat, the W3WT02 model with Wi-Fi connectivity is just the tool to help optimise your heating. Feel free to view our range of Thermostats. One of the most effective ways of retaining your heat, thus reducing your energy consumption is through effective insulation. Not only on your walls and doors but on your floors as well. Warmup makes use of Marmox insulation boards which are thin sheet boards designed to insulate the floor surface of new or existing buildings, saving up to 50% of the heat lost with conventional underfloor heating. Good insulation ensures no energy goes to waste, keeping heat loss to a minimum, thus requiring less heating time. Not only do these insulation boards work as thermal barriers, but are also waterproof and have excellent acoustic properties, absorbing a lot of the ground noise when walking around. More info about the heat loss in the house? Underfloor heating uses a radiant heating source which distributes heat evenly throughout the room. It is known for being both cost-efficient as well as eco-friendly. Its ecological heating system runs at a much lower temperature whilst still reaching the same (if not higher) comfort level than conventional radiators, thus using less energy. Depending on the floor surface and whether or not the floor has an insulation barrier, you can expect the floors to reach the desired temperature within 30 – 60 min. Using a programmable thermostat allows you to schedule heating times and temperatures to accommodate your daily routine. You never have to walk into, or wake up in a cold house again! Warming the room from the ground up means that underfloor heating heats the people in the room as opposed to the air. Therefore, no energy will go to waste. Interested to see what your approximate running costs for underfloor heating could be? The power supplier you choose can make a big difference on your electricity bill. One of the best ways to keep on top of your energy bills without any changes in lifestyle is to change energy suppliers. 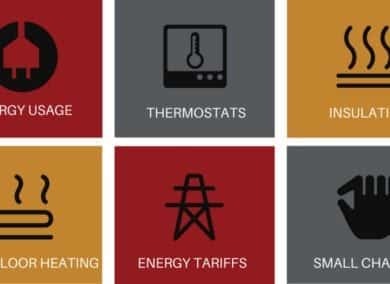 Many companies give great energy consumption reports, which you will be able to match back to your Smart Thermostat to see where and how you can better manage your energy use. Check if your power company offers specials as sometimes it works out cheaper to purchase your electricity in advance. Do you know how much you are paying per kilowatt of power? When it comes keeping your home warm (and dry), it’s easy to overlook the simple things that go a long way in supporting your heating. Irrespective of what source of heating you choose for your home, whether or not you have proper insulation on your windows or doors, simple things like closing the curtains go a long way to prevents heat loss. Placing dampers on open fires to reduce warm air rising up chimneys when they are not in use. Make sure the kids haven’t left windows ajar. If your doors have big gaps on the floor, find something to close it up with. For any queries on our products, please contact us and we will be happy to assist!